“Beat Tech” has been a calling card of the University of Virginia football program since last offseason. Well, head coach Bronco Mendenhall and his team now have their chance to accomplish the stated goal of beating arch-rival Virginia Tech when the two programs meet for the 100th time Friday afternoon in Blacksburg. Mendenhall enters this contest with an 0-3 record versus Justin Fuente, a coach he holds in high regard for his offensive schemes. Mendenhall’s Virginia teams are 0-2 against Fuente-led Virginia Tech squads, and of course you have heard that Tech has won the last 14 Commonwealth Cups. In what would have been a shock (and may still be) at the start of the season, Virginia enters this latest rivalry game as the favorite. 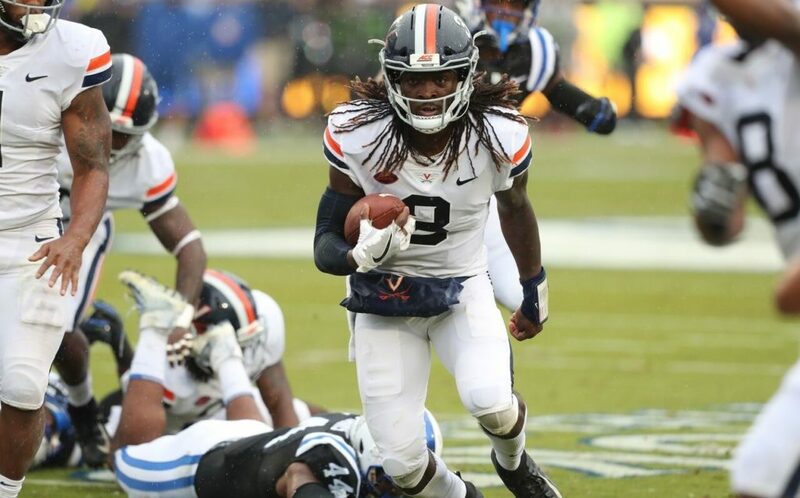 The Cavaliers have compiled a 7-4 record (4-3 in the ACC) to this point thanks to an improved offense led by dynamic dual-threat quarterback Bryce Perkins and a tough defensive unit that ranks no. 22 in the nation in total defense. Meanwhile, Virginia Tech hasn’t looked, well, like Virginia Tech this season. The 4-6 Hokies’ typically stout defense ranks 91st in the nation in scoring defense and 99th in total defense, a far cry from the unit that man-handled the Cavaliers last season. Virginia Tech has dealt with injuries and departures on both sides of the ball, most notably (on offense anyway) losing starting quarterback Josh Jackson during the loss to Old Dominion in Week 3. Junior quarterback Ryan Willis stepped into the starting role and has done a nice job, guiding Tech to the fourth-ranked passing offense in the conference (257 yards per game). The Hokies are averaging 28.2 points per game, which ranks 11th in the ACC and no. 72 in the nation. While neither team is playing for a spot in the Atlantic Coast Conference championship, there is plenty of importance on both sides. There is the Commonwealth Cup, of course, which the Cavaliers are looking to take back to Charlottesville for the first time since 2003. A win gets the Hoos to eight wins and prevents Virginia Tech from reaching a bowl game for the first time since 1992. The Hokies want to be able to extend their winning streak over UVA and have a chance to continue their bowl streak. Game Time: Friday, November 23, 3:30 p.m.
1. Can Virginia overcome the mental aspect? Yes, I know, this is Virginia’s 2018 team versus Virginia Tech’s 2018 team, but when a team has lost 14 consecutive times to its arch-rival, there will be some mental issues to work through. I do believe this Virginia team is much further along from a mental aspect than the program has been in years. This game will be the toughest test of the season in this regard. And it’s not only about doubt creeping in if things go badly. It’s about being too overhyped that you lose focus on playing football. At times last year Virginia seemed more interested in beating up Virginia Tech rather than beating Virginia Tech. Let’s see if the Hoos can find the right balance of playing physical and with emotion but also staying focused for 60 minutes. 2. Can the Virginia offensive line control the trenches and give Ellis room to run the football? Virginia Tech’s defense smothered Virginia last season, holding the Cavaliers to under 200 yards of offense, including a feeble five yards rushing. UVA’s offense is obviously different than it was a year ago, when the Hoos were more pass oriented with Kurt Benkert at quarterback, but the point is that Virginia Tech dominated the line of scrimmage. This year’s Tech defense has been given up some gaudy rushing numbers to opposing teams and is surrendering an average of 208 yards rushing per contest this season. As other teams have done, though, they’ll be looking to take away the run. It’s important for Jordan Ellis, who had only 33 yards on 12 carries against Georgia Tech last week, to get going in order to free up Perkins. The offensive line has to create room to run inside to get this accomplished. 3. How healthy is Bryce Perkins? Perkins not only returned to the Georgia Tech game after suffering a scary-looking left leg injury, but he played well and moved well upon his return. If healthy, he is the most talented athlete on the field Friday. His ability to move is huge in terms of what Virginia can do offensively. The 6’4”, 225-pound Willis, a junior, has started the last seven games for the Hokies, who have gone 2-5 in that span. He is a very capable player, tossing 17 touchdowns with only six picks this season. However, he is coming off his worst performance of the year against Miami (18-36 passing for 216 yards, 1 TD and 2 INTs), so we’ll see where he is confidence-wise against the Hoos. Willis’ favorite target is receiver Damon Hazelton, who has 745 yards receiving and eight touchdowns this year. He is one of seven players with double-digit receptions. 2. Running Back Steven Peoples. Peoples, a senior and former walk-on, is a hard runner with some pop. He leads Virginia Tech in what Tech calls “money plays,” which are plays resulting in a first down or touchdown. Peoples has 37 of those. He is the team’s leading rusher with 586 yards, averaging 5.1 yards per carry. Last season against UVA, Peoples rushed for over 70 yards as Tech gained over 200 yards on the ground. A capable receiver as well, Peoples has hauled in 19 catches for 169 yards. Senior defensive tackle Ricky Walker is the leader of this defense and will be a tough matchup for the Cavalier offensive line. Reggie Floyd is a playmaker at Rover. At linebacker, Rayshard Ashby is a name you can expect to hear called a lot on Friday. The Richmond (VA) native has a nose for the football and leads Virginia Tech in tackles. Tech’s leader in rushing tackles, Ashby also has 8.5 tackles for loss on the year. 1. Put up some points! Virginia has scored 20 points or more just three times in the last 14 meetings with Virginia Tech. The Hoos scored 21 points in a 33-21 loss in Charlottesville and put up 20 points in two other occasions. This Virginia Tech defense has surrendered 31 or more the last four outings. Will Virginia, which is averaging 28.3 points per outing this season, be able to take advantage? Certainly, the Hoos will have to perform in the red zone, where they are scoring points at only a 77.8% clip (this ranks 113 in the nation). Virginia Tech ranks 20th in the nation in this category with a 90% scoring rate in the red zone. Outside of Pittsburgh, which was dominating Virginia Tech by 31-7 at halftime and went on to secure a 52-22 victory, the Hokies have been outscored by double digits in the second-half of three of their last four games – Georgia Tech (14), Boston College (17) and Miami (21). Tech was either leading or within reach at the half of all three contests, trailing by seven at the half against the Yellow Jackets and by three against the Hurricanes but leading Boston College by seven. The second-half has been a major issue for the Hokies during this 4-game losing skid. Conversely, Virginia can improve in the second-half, especially on offense. While the Hoos have outscored its opponents in the third and fourth quarters this season, the offense has scored significantly fewer points in the second-half (124) than the first (187). Virginia has gained 17 turnovers and lost 15 while Virginia Tech has gained 13 and lost 12. Turnovers are important in every game, but especially in a rivalry game. Virginia last won in Blacksburg? Of course you do! In 1998, UVA overcame a 29-7 halftime deficit to defeat the Hokies 36-32. Quarterback Aaron Brooks’ touchdown pass to Ahmad Hawkins was the game-winner. Virginia’s game-winning score is below. I also dug up this article by Jeff White when he was with the Times-Dispatch. In the piece, former Cavaliers Byron Thweatt and Hawkins recall the memorable comeback that took place 20 years ago.